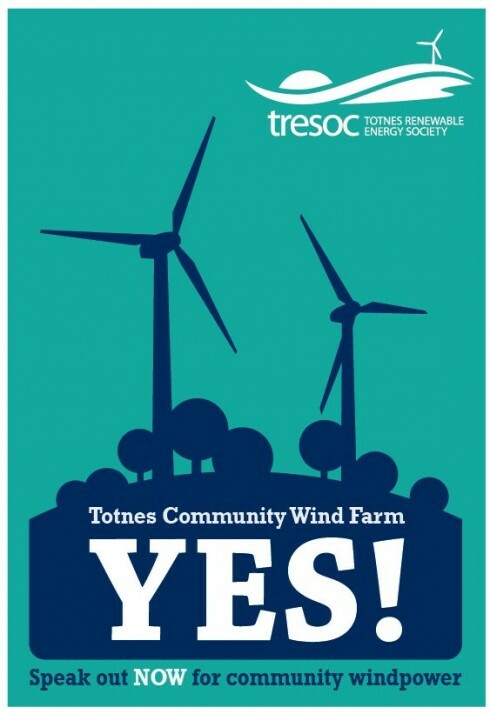 I am writing to express my unequivocal support for TRESOC’s application for 2 wind turbines between Totnes and Harbertonford. It is such an important and exciting scheme, and it is vital that it goes ahead. I am a local resident and also one of the co-founders of Transition Town Totnes, which established in 2006 with the aim of trying to inspire and support the building of community resilience in Totnes and District, although I am writing this letter in my own personal capacity. The Totnes Renewable Energy Society emerged from an Open Space day and has had the full support of Transition Town Totnes ever since. I strongly believe that these two turbines will not in any way detract from their surroundings, rather they will enhance the area. I am happy with the their appearance and am sure that they will have no significant impact in terms of noise. I have visited lots of wind energy sites, and always find them to be very beautiful and graceful. The trip through Cornwall, which passes through 2 wind developments, is always a highlight of that journey. I also visited Denmark several years ago, where there are many wind turbines in the landscape, and found it very inspiring. 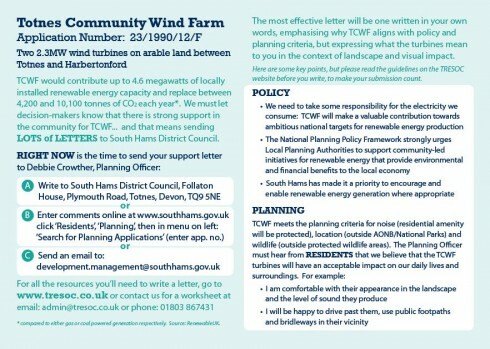 They will not in any sense impact on my enjoyment of the area, rather I think they will become a focal point, a demonstration of a community taking climate change seriously and deciding to act rather than just talk about it. Hundreds of people every year visit Totnes to learn about Transition, to see, in practice, a community responding pro-actively to the challenges of our times. To have these turbines in place is a very powerful statement of intent, a symbol of what is possible when a community comes together. Put alongside the other exciting initiatives underway in Totnes, such as the Atmos project which is seeking to bring the former Dairy Crest site into community ownership, Transition Homes, the Food Hub, the Economic Blueprint (due to be published this Autumn), Transition Streets (winner of the 2011 Ashden Award), the Co Housing group that is working with the Baltic Wharf Development, and many others, these turbines, and the other projects planned by TRESOC, can be seen as part of a very exciting whole. In these times, initiatives that bring a financial return to communities are sorely needed, and this will be an exceedingly well-run, democratic, exemplar demonstration of this in practice. I am a father of four children who is exceedingly worried about the future that lies ahead of them. This summer has brought record-breaking droughts, to North America, one of the wettest summers ever recorded here, climate records are being broken around the world, and scientists are deeply shocked by the speed and scale of the melting of Arctic ice this summer, some predicting it could be all gone by 2015. The strong scientific consensus is that human activity, in particular emissions of carbon dioxide, is the primary driver of this. When national government fails to afford responding to climate change the seriousness it deserves, it falls to us, in our communites and as individuals, to lead by example and to show what is possible. In this context it is impossible to over-stress the importance of this application. Some of those who have, for their own reasons, decided to oppose this application, will argue that they will somehow ‘destroy’ the area, ‘blight’ it for future generations. In 1939, when this nation was faced with the danger of an imminent Nazi invasion, we built fortifications and pill boxes along our coastline, many in beautiful places. Now they are part of our history, we celebrate the responsibility of those who built them, tell stories about them, and they form part of our culture. They were built so that our children would be able to live in a future that offered them safety, security, freedom and stability. We have the same challenge now. This is an application to celebrate. To celebrate that this community cares enough to have got this project to this stage. To celebrate the fact that it has 500 members from the community prepared not just to talk about why no-one is doing anything but to put their money where their mouths are. To celebrate what will be a powerful symbol of a different way of generating energy, owned by local people and for the benefit of local people. To celebrate that Totnes, the birthplace of the Transition movement which Nicholas Crane, on BBC 2’s ‘Town’ programme described as “the urban brainwave of the century”, is one step closer to becoming a national showcase of what is possible when a community decides to come together to see the challenges we face as an opportunity to come closer together and to be brilliant. To celebrate the amazing expertise and know-how that TRESOC have pulled together for this project. I hope that the outcome of this application will also be something to celebrate, and I thank you for taking the time to read this. Everything you need to know to write your letter of support is here.